It was a super fun and easy project, so I thought I would share what I learned about cross stitch so you can try your hand at stitching something too! It is a specific type of embroidery, in which you use thread and a needle to stitch many little crosses on to fabric and all the crosses together form an image on the fabric. To get started, you will need some fabric to stitch on. There are two basic kinds used in cross stitch: Aida and evenweave. They are both easy to use, just different! I started with a 14-count Aida fabric because it does have more obvious holes to stitch into than evenweave, but I am sure you can figure out evenweave as a beginner, too. To help you choose, you can learn more about each fabric on the Cross Stitch Guild’s website. Both Aida and evenweave come in various colours, so make sure you choose one that will go with the design you want to make – it does make a difference to your overall project. You can usually get both kinds of fabric, in a variety of colours, in most general craft stores. Of course, you also need something to stitch with: embroidery thread (floss). The most common type, and the one most recommended for beginners, is DMC cotton floss. This floss is 6 ply, which means you can separate it into 6 different strands. In most cases, you have to separate them and use only 1, 2, or 3 strands at a time, not the full 6. You can see a great image of how the thread splits on the DMC website. Floss comes in a crazy number of colours, so have fun shopping for just the right shades for your project! You will also need a needle. For cross stitch you use a blunt tipped tapestry needle, NOT a sharp embroidery needle. You don’t want to pierce through the fabric itself when cross stitching (unless you are doing a fancier stitch), but instead through the holes of the fabric. The most common sizes used are 24 and 26. The size you use depends on the fabric you have chosen, and how many strands of thread you are using. If you are using a fabric with larger holes to stitch into and more strands of thread (2 or more), than use the larger size 24 needle. If your fabric is finer and you are using fewer strands (2 or less), use the smaller size 26 needle. A good test is to pass the needle through the fabric – if the needle makes the hole larger, it is too big. I used a size 24 needle and 3 strands of thread for my project, but from what I have read since, most people use only 2 strands on 14-count Aida. Working with three strands worked out fine for me – my stitches were simply thicker and more raised from the fabric. It is all a matter of preference, so experiment using the fabric you have choosen. Next time, I plan to experiment and try only 2 strands. You may also want to get a hoop to hold your work as you stitch. A hoop is made up of two wooden or plastic circles, one small one that fits inside a larger one. You stretch your fabric across the small circle and keep it taut and in place with the larger circle. You can see how it works on the DMC website. Many stitchers use a hoop to help hold the fabric for them and keep it taut while stitching, but others prefer not to use one at all and simply hold the fabric in their hands. Try out both methods and see which you prefer. Hoops come in both wood and plastic, in a variety of sizes and shapes. Again, you need to experiment with each kind to see which you like to use – there are mixed reviews! When using a hoop, make sure you choose a size that is larger than the pattern you want to stitch – you don’t want your work to be pressed in-between the two hoop pieces. There are alternatives to hoops, such as scroll bar frames and stretcher bars, so if you aren’t a fan of the hoop, check these out and see if you like using them instead. Finally, you will need a good pair of really sharp scissors that are used exclusively for your stitch work. You may already be familiar with the stork scissors that many people use for embroidery and cross stitching, but of course, a normal pair also work, just make sure they are super pointy for cutting the fine threads accurately. These two sites are really all you need to get started reading a pattern and making a cross stitch project of your own, but if you prefer books, I have also read parts of The Cross Stitcher’s Bible – see if your library has it (that is where I got mine!) because it has some great tips and techniques to improve your stitches as well as embellishments to try. There are so many really great cross stitch pattern designers out there. A good place to start is Etsy, but of course just Googling something you want to stitch is also quite effective (I found the Blue Jays Logo as a google image). Another neat website for some quick and simple designs is the Daily Cross Stitch website. Visit it everyday for a new free pattern! You can also try your hand at creating your own design. You can convert any image into a cross stitch pattern by using a program that will turn it into a bunch of little squares, just like a cross stitch design. While I haven’t tried it myself (yet! ), there are free options out there to try for yourself (just Google it). Once you are done your project it is a good idea to wash it, even in just water, and to press it using an iron. This will remove any wrinkles and other things that may have gotten on your fabric while you were stitching. Now you have a beautiful design on a piece of fabric, but what do you do with it?!? I simply put mine back in the hoop to frame it and sent it off to my brother. In the hoop, it can be hung up as a piece of art on your wall, or sit in a stand on a table. I followed the video by Shiny Happy World on how to frame using a hoop. You can also place your work in a normal picture frame to hang on your wall. Or, you can turn it into a bookmark, a pin cushion, a pillow, a greeting card, etc. I have started a Pinterest board with ideas on what to do with cross stitch projects. And that is all I have learned so far! I hope it helps you if you want to start to cross stitch, too. I highly recommend it as a relaxing craft. Not long ago I was mailed two handmade crochet hooks by Krystle of HeartSprinkle. Krystle sculpts beautiful handles for metal crochet hooks using polymer clay. Her favourite hook to make is her signature honey bee hook, and I was lucky enough to receive two of them as a gift! Krystle makes her handles on any brand of metal hook, so you can choose your favourite – whether it be a Susan Bates, Boye, or Clover Amour hook, she can make a unique personalized handle for it. I chose to have one handle made on a Susan Bates hook because I had never tried an in-line hook before, and one on my all time favourite Clover Amour hook. What I love most about these hooks are the small details. Each has a cute little bee with little translucent wings flying over hand painted clouds and flowers. The green around the flowers shimmers and there is a fun dotted trail leading from the bee’s hive to the bee. The end of the handle is stamped and imprinted with a letter indicating the hook size, plus there are additional imprints on the body of the handle: the hook size in mm and the HeartSprinkle logo. The handle is smooth and warm, so nice to hold. It is a large handle, so does take some getting used to if you are accustomed to holding only the thin metal hooks, but with time it feels natural to hold. Krystle has tested her handles for strength, so they will not break or crumble if they are mishandled (mine have survived a few drops off my desk onto hardwood floor!). If you want to see the hook in action and up close, just watch one of my more recent tutorial videos: joined rounds in amigurumi, stripes in joined rounds, and joining legs in joined rounds. Along with my two hooks, I also received a set of stitch markers. They are ADORABLE. One is a little bee, with a neat black bead for a head, a little beehive, and a small flower. All match perfectly with the bee hook design. Each has a lobster claw clasp, which I am not a huge fan of for amigurumi because they can be tricky to open and with amigurumi you need to move the marker a lot, but they work great if they are staying in one place for a while, or for my knitting (I hook them onto a ring marker for larger needles). Krystle also makes markers with a simpler hook which are easier to place and remove (see the heart marker below). Overall, the hooks and stitch markers are really fun to work with and make my time crocheting a little more special and personal. You can tell a lot of care went into making each item. Krystle is a great artist who obviously takes great pride in her work and has a true love for crochet – including a love for amigurumi! You can see more of her art work, not just polymer clay, on her Instagram – she creates adorable kawaii drawings, too. If you want to learn more about Krystle and her work, visit her on Facebook, Twitter, Instagram, and Etsy. Have a special request? Just drop her a message on Etsy! Krystle is my go to sponsor for my amigurumi CALs, so if you want to win a hook for yourself, stay tuned for news on the latest hookabee CALs and join in! 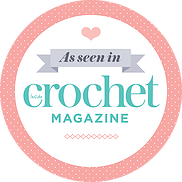 My most recent pattern has been published in the digital crochet magazine Happily Hooked! You can find my cute little spring caterpillar pattern, along with the patterns for 9 additional designs by other crochet artists in the most recent issue of Happily Hooked. I will eventually have the pattern available in my shop, but if you want it now, you can have a trial run of the magazine for only $0.99. That is a pretty good deal! I like that this magazine is digital, so you can read it on any device you have, but you can also save it to your ravelry library or download it and save it as a PDF to read later if you don’t have the time when it is first released. You can also get a a “gold membership” to the magazine for a little extra (you can add it after you purchase a regular subscription) and you get even more free patterns and deals – including my little Bobby the Bumble Bee pattern until mid March! The caterpillar pattern is really fun – you can use up yarn ends you have in your stash, even yarn from different brands, and your caterpillar will turn out pretty unique! While the pattern is written in joined rounds for cleaner colour changes, you can make it in continuous rounds if you prefer. The little legs are fun bobble stitches, and if you change there position each round, your caterpillar will look like it has crazy dancing legs! I look forward to seeing lots of caterpillars come out for the spring – which I hope is on its way soon! !